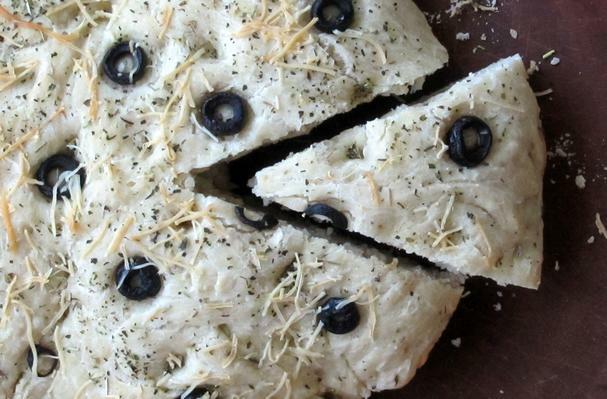 Foodista | Recipes, Cooking Tips, and Food News | Focaccia! Use a small amount of olive oil to grease the inside of a round 9-inch pan. Combine the first five ingredients in a large bowl. Beat at high speed for about one minute, with a stand mixer or electric mixer. Scoop the sticky batter into the prepared pan, cover with a kitchen towel and let it rise for one hour at room temperature. It will become puffy! While the dough is rising, preheat the oven to 375 degrees. When the dough is finished rising, lightly poke the top of the dough all over. Using a pastry brush, brush the top of the dough with olive oil, gently push-in the sliced olives, sprinkle with herbs and shredded cheese. Bake for 35 to 40 minutes or until the loaf is golden brown. During this time, your house will smell like Italy. No joke! Remove from the oven and allow it to cool for five minutes before you remove from the baking pan. Cool on a wire rack. I recommend serving this warm! My house smelled like Italy. Let me tell you, it was amazing! I took my 5th or 6th try at making a yeast bread, and what emerged from my oven was a fragrant focaccia loaf! I had to do a double-take…did I really make that? Did my loaf actually rise and not feel like a heavy brick?